Quesadillas are a definite go-to for me. You could sub in cheddar or Colby Jack or a different type of salsa. The idea here is to use whatever you have on hand. If you have leftover steak, chicken, or pork, go ahead and add that too! 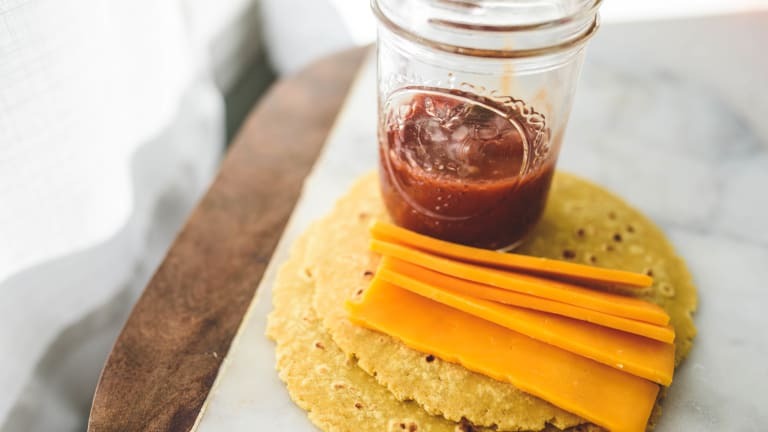 Paleo: Use dairy-free cheese, and add chicken, steak, or pork; use Paleo tortillas. 1. Heat a skillet over medium-high heat. 3. Place the folded tortillas onto the skillet (you may be able to fit 2 at a time, depending on the size of your skillet). Cook until lightly browned on one side and cheese is beginning to melt, then flip and cook until the other side is lightly browned and cheese is fully melted. 4. Top with desired toppings.